Out of curiosity, he proceeded to 'H' to see how many people were talking homoeopathy, Big B's real-life counterpart that isn't. There were none. Instead of sulking in his clinic about the plight of his profession, Shah, 33years old, decide to do something about it. He put it on the Internet. "Homeopathy is a victim of ignorance" he says. "People say its not a science, it's not a substitute, it doesn't cure, its too slow, it's this, that, and the other. We want to prove them all wrong. Not just locally but globally-on the web." And so info@askdrshah.com isn't some time-strapped medico's hurriedly-scribbled prescription note but Shah's e-mail address. And through it, the curious and the cure-seeking anywhere on the planet can come on-line for advice and action. And quite a few do. A 32-year old man from Delhi who mixed business with pleasure in the wrong proportion in Jakarta contracted venereal infection and passed it on to his wife. At his wit's end, he bumped into Shah on the infobahn. And all ended well. 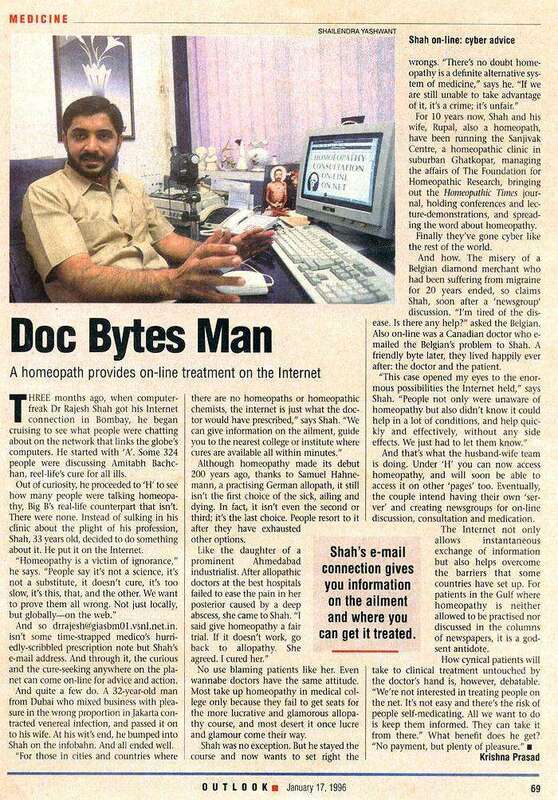 "For those in cities and countries where there are no homoeopaths or homoeopathic chemists, the internet is just what the doctor would have prescribed, says Shah".We can give information on the ailment, guide you to the nearest college or institute where cures are available all within minutes. Although homoeopathy made its debut 200 years ago, thanks to Samuel Hahnemann, a practicing German allopath, it still isn't the first choice of the sick, ailing and dying. In fact, it isn't even the second or third; it's the last choice. People resort to it after they have exhausted other options. Like the daughter of a prominent Ahmedabad industrialist. After allopathic doctors at the best hospitals failed to ease the pain in her posterior caused by a deep abscess, she came to Shah. "I said give homoeopathy a fair trial. If it doesn't work, go back to allopathy. She agreed. I cured her. No use blaming patients like her. Even wannabe doctors have the same attitude. Most take up homoeopathy in medical college only because they fail to get seats for more lucrative and glamorous allopathy course, and most desert it once lucre and glamour come their way. Shah was no exception. But he stayed the course and now wants to set right the wrongs. "There's no doubt homeopathy is a definite alternative system of medicine" says he. "If we are still unable to take advantage of it, it's a crime; it's unfair." For 10 years now, Shah and his wife, Rupal, also a homeopath, have been running the Sanjivak centre (now, Life Force Homeopathy) a homeopathic clinic in suburban Ghatkopar, managing the affairs of The Foundation for Homoeopathic Research, bringing out the 'Homeopathy Times' journal, holding conferences and lecture-demonstrations and spreading the word about homeopathy. The misery of a Belgian diamond merchant, who had been suffering from migraine for 20 years ended, so claims Shah, soon after a 'newsgroup' discussion. " I'm tired of the disease. Is there any help?" asked the Belgian. Also on-line was a Canadian doctor who e-mailed the Belgian's problem to Shah. A friendly byte later, they lived happily ever after: the doctor and the patient. "This case opened my eyes to the enormous possibilities the Internet held," says Shah. "People not only were unaware of homeopathy but also didn't know it could help in a lot of conditions and help quickly and effectively, without any side effects. We just had to let them know." And that's what the husband-wife team is doing. Under 'H' you can now access homeopathy and will soon be able to access it on other 'pages' too. Eventually, the couple intends having their own 'server' and creating newsgroups for no-line discussion, consultation and medication. The Internet not only allows instantaneous exchange of information but also helps overcome the barriers that some countries have set up. For patients in the Gulf where homeopathy is neither allowed to be practiced nor discussed in the columns of newspapers, it is a god-sent antidote. How cynical patients will take to clinical treatment untouched by the doctor's hand is however debatable. "We're not interested in treating people on the net. It's not easy and there's the risk of people self-medicating. All we want to do is keep them informed. They can take it from there." What benefits does it get? "No payment, but plenty of pleasure."